Savanna, the premium cider that knows how to stand out from the crowd, is strutting a bold new look and dashing frame that may be new on the outside but you’ll still find the same, distinctively dry taste on the inside. 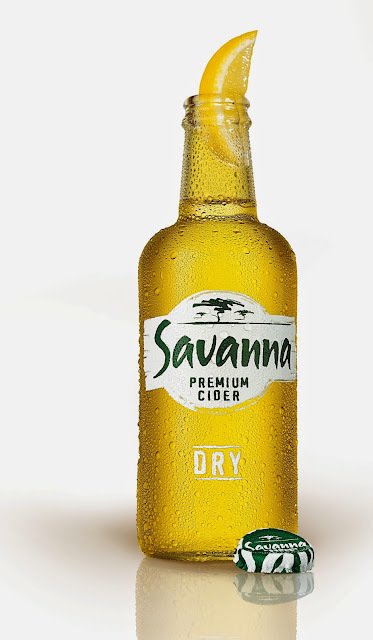 With its charismatic appeal and left-of-centre attitude Savanna Premium Cider continues to lead the pack with three refreshing varieties: Dry, Light and Dark. Since the launch in 1996, Savanna has certainly had work done, but while it has slipped into something new on the outside, it remains the much loved dry, 100% clear apple cider on the inside. In the sharp-witted, progressive world of Savanna the only constant is change so the mould has been broken to make way for a completely new glass bottle. Not your average makeover, the new Savanna bottle now stands bold, confident and easy on the eye, yet remains refreshingly simple. Cider royalty deserves a crown so caps off to the new bold crown design which is guaranteed to turn a few heads. Up to its neck in style, Savanna is on trend with a longer and slimmer neck for the ultimate drinking experience. Savanna’s workout has paid off big time. See the results with stronger, more manly shoulders. The slick new label has had a few touch-ups too leaving it more refined with a cleaner feel to add the finishing touch to Savanna’s fresh new look. And when it comes to functionality, debossing on the side lets your fingers find the savvy Savanna name with every letter boldly engraved to add “grippability”. Yes that’s a word now! Don’t keep your excitement bottled up. Experience the “before” and “after” transition and be part of the new pack reveal one change at a time on Savanna’s brand new mobile-first website www.savannacider.com . You can also catch all the action on Savanna’s popular social feeds, facebook.com/savannacider, Twitter @SavannaCider, Instagram.com/savannacider and YouTube. Look out for the all new Savanna TV ad and tune into the new radio spots. Savanna will also be standing tall in spectacular city spaces and making its presence felt in newspapers, magazines and trending online sites. Loyal fans can look forward to epic Before and After parties taking place around the country, which are sure to provide unexpected experiences. Details of how to win tickets to these totally cool events are found under the cap when buying your next Savanna. Have a great time with the all new Savanna bottles! Available at leading stores country-wide at a recommended price of R66.95 per 6-pack or R239.95 per case, Savanna is letting the world know that this Premium Cider is New on the Outside, Still Dry on the Inside.